Greece and FYROM: a march for peace and reconciliation anyone? On Sunday the 21st of January, hundreds of thousands of Greeks marched in the country's second largest city Thessaloniki, to protest against the use of the name “Macedonia” in a solution to a dispute between Greece and the Former Yugoslav Republic of Macedonia (FYROM). The event was organized mainly through social media and it came days after U.N. Mediator Matthew Nimetz, presented new proposals to end the 25-year-old dispute between the two countries. He wouldn’t comment on the ideas he presented but said: “I myself don’t think it’s realistic to expect the Former Yugoslav Republic of Macedonia not to have Macedonia in some form in its name.”(The Washington Post). 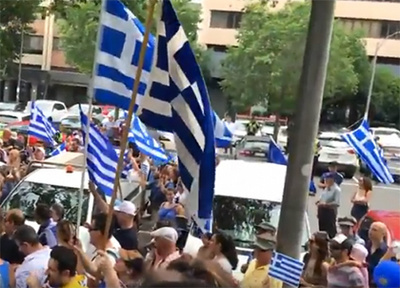 As result, his remarks started a wave of objections and protests among many Greeks in the country and among the Greek diaspora, who oppose the use of the term "Macedonia" in the neighboring country's name. While I do not object to the right of people to organize marches to express their opinions, this protest was obviously something solely for internal consumption. The view of the majority of Greece's public opinion has always been known, but international diplomacy does not work in the same way. Both the EU and NATO are keen to expand and include the Western Balkan region in their circles, thus it is only a matter of time before they apply pressure on both nations to solve their dispute. In addition, the leadership of Greece and FYROM also seem to want to find a solution. FYROM has said it will rename its airport in a step designed to reassure Greece and unlock its NATO and EU bids. "To demonstrate that we're committed to finding a solution, I'm announcing that we'll change the name of the airport and surrounding avenues," FYROM prime minister Zoran Zaev stated, referring to the Skopje Alexander the Great Airport. Thus any protests from the Greek public, no matter how well intended, honest and patriotic, do not help the efforts to end the stalemate. They are simply a desperate attempt to satisfy its nationalism and insecurity. The atmosphere during the march was often so charged as if there was a war brewing. How can this help the negotiations? One could wonder why should the Greek public be bothered about the neighboring country's fate. Afterall, Greece is already in the EU and NATO, plus it has a veto so it can do whatever it wants. It shouldn't have to compromise. But they got to realize, that as long as the region is divided, unstable and each country at each other's throats, no country in the Balkans will ever be as prosperous as the rest of Europe. Stability means prosperity, plus cross-border and foreign investments to better the region's infrastructure and economies. It also means competitiveness and cooperation between all nations, which participate in the European single market. Finally, it makes absolutely no sense to have a hostile country at your doorstep. I personally am tired of all this hatred and nationalism in the Balkans. In Greece, we have been kept in constant fear that all countries around us want parts of our land. Turkey wants the islands, Albania the North-Western part of the country, FYROM wants Macedonia. Some may do; there are nationalists in every country in the region and even in Greece, there are still people that dream of getting lost lands back. How futile this is in modern Europe. Instead of trying to become a modern European society and economy, people in the Balkans want border redistribution. However, the Macedonian issue for the Greeks is not financial, rather emotional and of national pride. Partially they are right. With the collapse of Yugoslavia, we saw a rise of nationalism in all its former republics. FYROM started a barrage of propaganda to appropriate Greek history, in order to establish its own identity. That didn't go well with the Greeks and especially the more nationalist and conservative elements in the country. Since then, Greece has continuously blocked the entrance of FYROM in both the EU and NATO, in order to pressure the country to back off its claims. In this instance, the Greeks are rightfully trying to protect their heritage. But they must also accept that when we are talking about Macedonia and its history, we are not only talking about the ancient or the modern one. Between these times, Macedonia as a region was in constant change, both in terms of borders and its ethnic groups or society. And while the Greeks are right to try to stop FYROM from appropriating anything to do with the ancient kingdom, they conveniently forget that during the rest of Macedonia's history, its society was multicultural and diverse as many of today's Europe's regions. So who has the right to call himself Macedonian? Obviously, everyone who resides or resided in the region for generations. Just as anyone can call himself European, once he and his ancestors have been living on the continent for a considerable amount of time. Thus, if FYROM learns to respect Greece's sensitivity on the matter, there is no reason why the two countries can not share the name or even the heritage. As long as FYROM understands that if it wants to link itself to the ancient kingdom, it must realize that it has itself Greek heritage. There is no shame in that. In Europe, we have a very exclusive view of our heritage, with each country trying to safeguard it against its neighbors. In reality, it is the result of years of cultural exchanges, occupations, invasions, wars, expansions, trade and intermarrying. So instead of heritage dividing us, it should be uniting us. In the case of Greece and FYROM, this division has been poisoning both countries for decades. Why can't the ancient kingdom and its history act as a link to bond the countries together, rather turning them hostile to each other? It should be an honor for us Greeks if any of our country's neighbors, is claiming that it has links to our ancient heritage. But this is not the same as appropriating, just like FYROM tried to do until recently, especially with its previous right-wing Gruevski government. We must learn to work together in the Balkans but first, we need to understand and respect each other. So perhaps the next massive protest the Greeks should organize about Macedonia, would be to walk all the way to the borders and meet people of FYROM and hold joined demonstrations for peace and reconciliation. The two countries have been close economic partners for decades, with Greeks investing in the country and visiting its casinos or hotels and vise versa. Many tourists from FYROM are visiting Northern Greece each summer, contributing to the country's economy. Imagine what can we achieve if we manage to put this behind us. Both countries can gain a valuable ally in the region and a close partner in EU and NATO. Together perhaps with Cyprus, Bulgaria, Romania and other Balkan democracies, they could form a formidable economic block within the EU. In fact, EU membership is the safest option to end all disputes in the region. Once inside the block, how can one member have territorial or other claims against another? The EU would immediately act against such member and mediate for a solution. It is heartening that the current FYROM PM Zoran Zaev is making considerable efforts to reverse Gruevski's damaging populist policies, that offended and infuriated many Greeks. Similarly, it is exciting to see that on the Greek side, people are becoming more open about the possibility of finding a solution, that will include the term "Macedonia" in the neighboring country's name. The Republic of Vardar Macedonia, as is one of the five possible names for the small republic that Matthew Nimetz suggested, is what I would personally go for. It sets a clear distinction between the two regions, without the possibility of any territorial dispute that a "North" or "Upper" term, would potentially imply, making many Greeks uncomfortable. It still gives the right to FYROM to keep its name and identity, without cutting off Greece from what is rightfully its own; its history and heritage that its people are so proud and protective of. Twenty-five years of hate, diplomatic failures, trade embargos, cyberwar and bullying, propaganda and blockage to enter the EU and NATO institutions are enough. It is a toxic situation that we all should be ashamed to pass on to the next generation. I am far from being a nationalist ....I’m a peace loving cosmopolitan humanist,poet and artist in fact....but foremost I believe in science and facts , and the history that has happened. I could not disagree more with you on this, in dismissing the sentiment of the vast majority of Greeks in Greece who simply want to protect their own native heritage from appropriation by outsiders as being ‘nationalist’ is being naive and frankly disrespectful. Archaeologists such as Miller, King, Fox,etc,etc have all written on this matter and are against the historical revisionism that is being attempted by the Slavic peoples of FYROM,and are all for the rights of Greece in this matter. In fact more than 200 archaeologists have signed a petition for this. History cannot be forgotten or erased all for political expediency or NATO, or due pressure from the US. You shall have my response in an historical paper of my own in the next few months to be published here to counterbalance your position. We Greeks have suffered these last few years, our economy collapsed, humiliated by our creditors and ‘allies’, but ask us to give away our history?....our heritage? That’s the only treasure we have left, and we will never sell this out for anyone!